Speaker: Viola Fodor, M.Ed is an educator, psychotherapist, author, creator of Life Process Transformation™ and speaker on wellness, stress, and personal transformation. 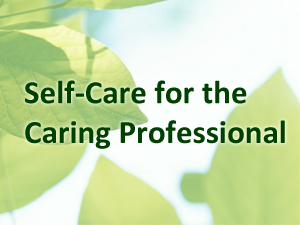 About the Workshop: As nursing educators and health care professionals, we need to take care of ourselves if we are to take care of others. That is not always so easy to do. Viola Fodor will help you explore the basics of true self-care and how you can find the time in your life to nurture your self—body, mind, and spirit. Emphasis will be on honest self-examination, quieting the mind, and nurturing the inner self. Register by October 18th , please contact Lisa Richter. Please advise of any dietary restrictions.